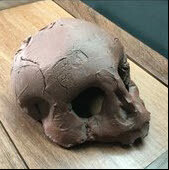 Together with a bonsai sensei, who already planted a bonsai in a real skull, the idea was born to do skull pots. The first four saw the light in January 2016. As usual no mould were used in the creation of this pot, they are all sculptured . built by hand. Death is life. 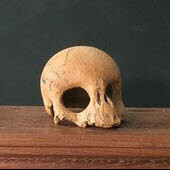 Our fascination with the skull may reflect the fact that we all are going to die, the ultimate justice. We can run but we can not hide. Our bodies will decompose and feed the next generation of life. 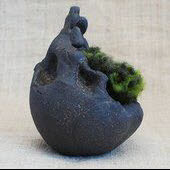 If we can see the beauty in this, we can also see that the combination of a skull and a plant evokes emotion. The harmony in the composition is already there from the beginning. 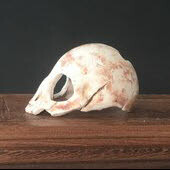 The work of these skulls are constantly evolving. The first pieces I made was more abstract and resembled rocks and stones. Now they have become more realistic in both colour and form. But I can think that they one day will return to the shape of a stone in which you can imagine the eye sockets, teeth and broken bones. 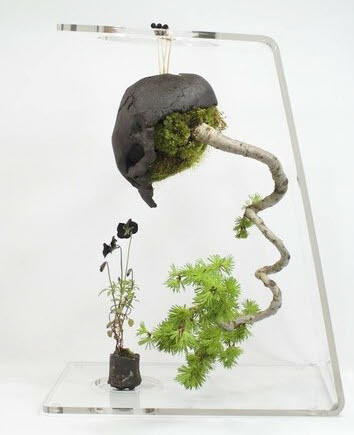 This fantastic and unusual piece features a cascade style Larch planting and shows what can be done with these unique skull pots. This piece was put together by Frank Gadegast. The pots can also be placed upright on a bench for a more conventional style planting. Either way these pots are truly unique and can be used in many ways. A really great video of Alex Mia Bonsai of European Bonsai Potter Collective interviewing Thor about his skull pots. The video gives an insight into the processes and materials Thor uses when making these amazing pots. 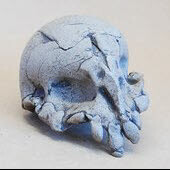 We usually carry a good range of Thor's skull pots in 3 or 4 different sizes and in various clay bodies. Click here to see The Thor Pots we have in stock now. Cant find the right skull? 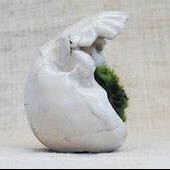 Well why not have one made specially for your bonsai tree or accent? Click here to see the full range of custom made signature pots and skulls that are now available to order.